Whoa, what a wild week. As of this writing, this blog has received 26,704 hits total, the vast majority of which came from one article submitted on Hacker News(HN) and linked via Techcrunch (TC) on my phone screening practices whilst in the employment of the most trusted brand in America. It’s pretty exciting to see the traffic come in waves, and for there to be genuinely interesting discussion on what I feel is a oft-encountered, rarely-discussed topic – software engineering interview practices. I totally should have slapped AdSense on this. By the time I write another dozen “How to ____ a Google ___” articles, I’d have pocketed a cool $20. Nevertheless, I actually feel a little bad about all the attention; I never meant to generate a linkbait article, and I would have preferred growing a readership base via a corpus of insightful and technical posts. That said, I did get some unexpected eyeballs on this site, and through the weekend drew some observations. As this is a one-time, uncontrolled, small sample test, these are definitely not conclusive; perhaps someone with more expertise in SEO and tech. blogging can corroborate these findings. Last Saturday, April 30th, I submitted “How to Score a Google Onsite Interview” on HN, then went to dinner. This is a new blog, I have a fairly new account in HN, and I wanted to test what kind of a response HN would give me. 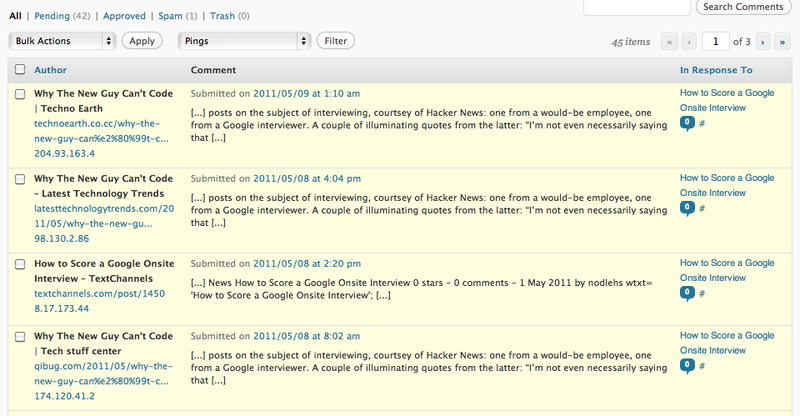 Within ~5 hours I got 5k hits and a load of comments as the article made HN’s front page. To my web host’s credit, they easily survived the bump in traffic on the 1/100th or however little slice of server I was actually allocated. Incidentally, the most popular outbound link was and has been “call yourself a 10 in Python, and we’ll have Guido van Rossum interview you”; I’d like to think I educated a thousand or so people on who the founder of Python is. After another three days the spike quickly died off, bottoming out at around 70 views a day. I got a few new followers on Twitter and Quora, a few personal inquiries on engineering and interviewing in general, but I was completely happy how well the article was received, and encouraged to write more. As expected, though, followup articles didn’t receive anywhere near the traffic, getting around 100 views per article despite their submissions on HN. Personally I think the others are more helpful and encroach on less populous topics, just that their titles just didn’t imply a job with Google. That’s a link from TC, dated the day after, with two views. I’m guessing the pings here were due to a draft being proofread. The TC article was posted on May 7th as expected, and of course traffic spiked again – the article was linked to via the link text “Google interviewer” and I was quoted once or twice, so that probably generated some attention. Two things were different between the HN submission and the TC link. On the first day, nobody made a comment on my article, despite the discussion on TC itself. Perhaps what needed to be said was already spelled out by HN members, but it’s more likely that the audience is different enough that the initial TC readers didn’t feel like saying anything. I did get some subsequent comments from the TC traffic, however. You’ll see on the top that there are 42 pending pingback requests. Now, I use Disqus to manage the commenting on ac, so these are all pingbacks from blogs that have linked to the article immediately following TC’s publication; that is, these pings are from content farms that copy TC’s posts verbatim. That I’m still getting pingback requests 2 days after the fact means either somebody’s scripts are running way behind, or they’re only picking up TC’s top posts. The traffic patterns are also somewhat different from TC – above, you can see the site’s traffic patterns, and the spikes for HN and TC. HN went way up through Saturday and then quickly dropped and died down; TC linkage has actually had its biggest day on Sunday, and as of this writing (early Monday morning) is still going strong. I attribute that to TC’s wider readership, social media presence, and the controversy that the original article has generated. I’m starting to pick up referrals from Google reader from the other side of the world, which suggests people are going to their RSS readers at the start of the weekday/workday. That’s all I’ve got so far. If anybody has more insights or wants to trash the anything-but-expert analysis above, publicly or privately, please don’t hesitate.